Some say it’s the food. Some say it’s the fun. Some say it’s the fans. Others swear it’s the bands. Contest any of those notions and a fight could break out … Did we mention the not-so-small matter of a football game? For the uninitiated, this is football like you’ve never seen it. We are talking black college football classics, where fans dressed in their Sunday finest descend upon dozens of cities — including some of the gridiron’s more hallowed grounds — for annual festivals and fanfare that sometimes last four, five or six days. Black college football classics feature parties in convention halls, nightclubs, apartment complex clubhouses and even parking lots. But there are also parades, professional mixers and college and career fairs. 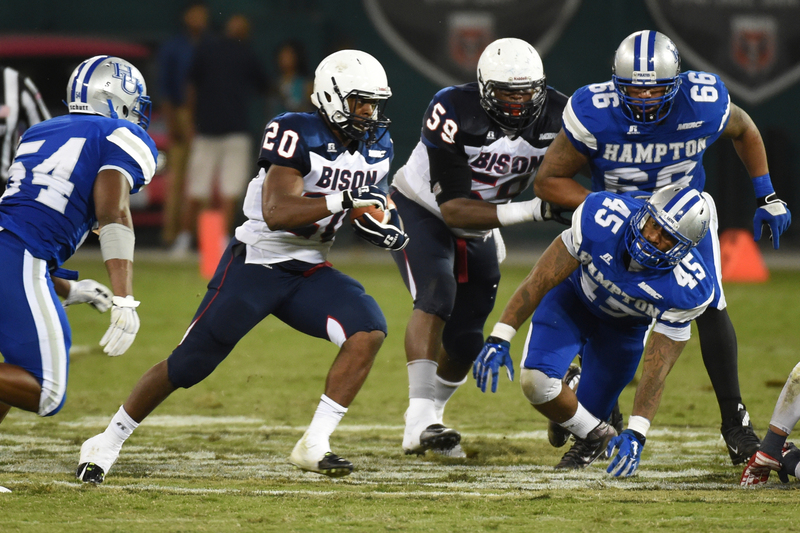 Howard Bison running back Aquanius Freeman (20) hits a big hole for a second quarter gain against Hampton on September 18, 2015 in Washington, DC. Marching bands — most of them featuring high-stepping, booty-shaking dancing dolls — show up and stage random battles, often leading to a formal Friday night battle of the bands, with the climax being the must-see halftime show on Saturday. Hours earlier, those same bands had marched along a morning parade route, sandwiched between national, statewide and high school acts — and greetings from every local dignitary from senator to mayor to dogcatcher. Come game time and way too many fans leave after intermission, arguing over who won the halftime band competition — even before the second-half kickoff gets underway. They won’t go too far, though. Most will be tailgating nearby and telling tall tales about their college days and past black college football classics, with the stories becoming more incredible as the years go by. Then after the clock ticks down, many fans stream back into the stadium to see the teams’ bands try to drown out each other. The classics date to 1924 when Tuskegee University and Alabama State University squared off in the inaugural Turkey Day Classic. Others soon followed, evolving to today, when games are staged almost weekly from Labor Day weekend to the final days of the Christmas-shopping season. Below are brief descriptions of the top 10 classics, with a mix of games of national significance as well as a handful of regional favorites. Also, you will see a complete calendar of 2016 black college football classics. 1 p.m. Nov. 19, Hampton, Virginia. 3:30 p.m. AT&T Nation’s Football Classic, Washington, D.C.